Nothing says Chinese New Year like a bright red lantern. It bobs and shines its good luck message. 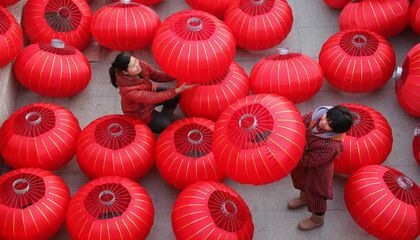 For many, these iconic lanterns are one and the same with China. Each year, China's annual lantern festival brings more awareness to the traditional form of lighting. The Agence France-Presse writes that lantern makers in China's self-proclaimed "lantern capital," the village of Tuntou are working overtime. Tuntou is in Hebei province. 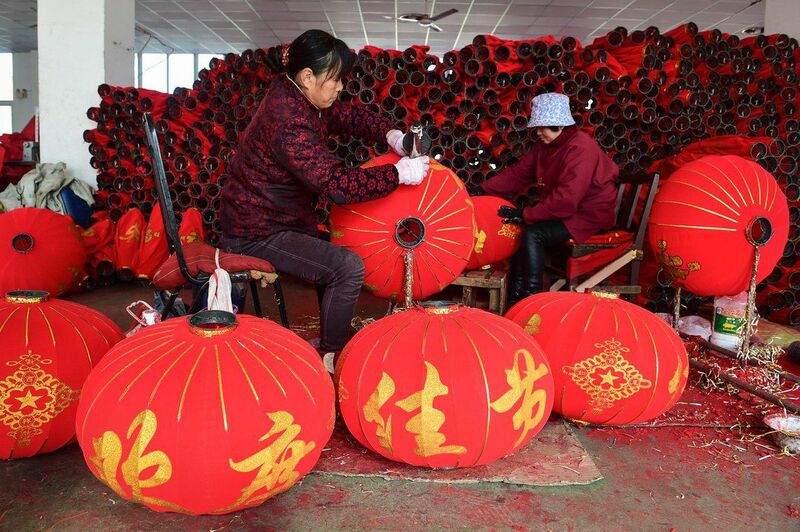 The craftsmen must make thousands of handmade lanterns in time for the holiday season. Tuntou has a long history of lantern making. China Central Television reports that the village has made lanterns since the 18th century. Artisans spend a lifetime working on their craft. Then they pass along their skills to their relatives. Tuntou has cornered an estimated 70 percent of the domestic market. That is according to CCTV. China's annual lantern output is shocking. It is estimated to be in the tens of millions. They are built in both large and small factories. The push isn't just for Chinese New Year. The lanterns are used for other celebrations, too. But Chinese New Year is the granddaddy of all lantern holidays. The color red symbolizes good luck in Chinese culture. And many lanterns are painted with phrases in Chinese. Tuntou's Communist leader tells the AFP that most lanterns are now decorated with "socialist core values" slogans. The leader says they reflect Xi Jinping's priorities. Xi Jinping is chairman of the Communist Party in China. He is the country's leader. His priorities are said to be prosperity, democracy and civility. They include harmony, freedom and equality. Justice, the rule of law and patriotism are also priorities. Dedication, integrity and friendship are included as well. But on China's Weibo microblogs, 90 percent of online comments about the slogans are negative. That was reported by the Asahi Shimbun. The people don't like the leader's comments. The comments reflect Xi Jinping's priorities. 90 percent of online comments about the slogans negative because they did not like the leaders's comments.According to the articular" But on China's Weibo microblogs, 90 percent of online comments about the slogans are negative. That was reported by the Asahi Shimbun".so that why they did not like comments about the slogans negative. According to the article ¨Chines lantern makers are gearing for the new year¨...Why are 90 percent of the online comments about the slogans negative.Based on the text I think they are negative because people probably don´t care.In conclusion I learned from the article that it takes a lot of work to make a great new year. because most if the lanterns have something to do with ¨social core values¨. And maybe most of the people don´t wanna be very social. In Chinese New Year people in china celebrate by having a big family dinner. They still put plates for absent family members. Three food served on a plate means something. The reason why 90 percent of online comments about the slogans negative because of Asahi Shimbun. Another reason is because the China's Weibo microblog. A third reason is because of politics. 90 percent of online comments about the slogans negative because they did not like the leaders comments. According to the acticular'' but on China's Weibo microblogs, that was reported buy the Anahi Shimbun". So that's why they did not like comments about the slogans negative . Its because the 90 percent of the online comments are that because they did not like the leaders comments. And the 90 percent are about the slogans are negative. So that's why they didn't like the comments about the slogans negative.